We've lived in our flat for just under 5 months + even though that involved buying a lot of new accessories + furniture, there are still a lot of bits missing, which are (I would say) vital! Our flat is in a big Georgian building, so the living room has a massive window and high ceilings, which I absolutely love, but natural lighting still ain't great - plus, all 4 walls in the room are painted in a very dark grey, so it really needs a pop of colour! 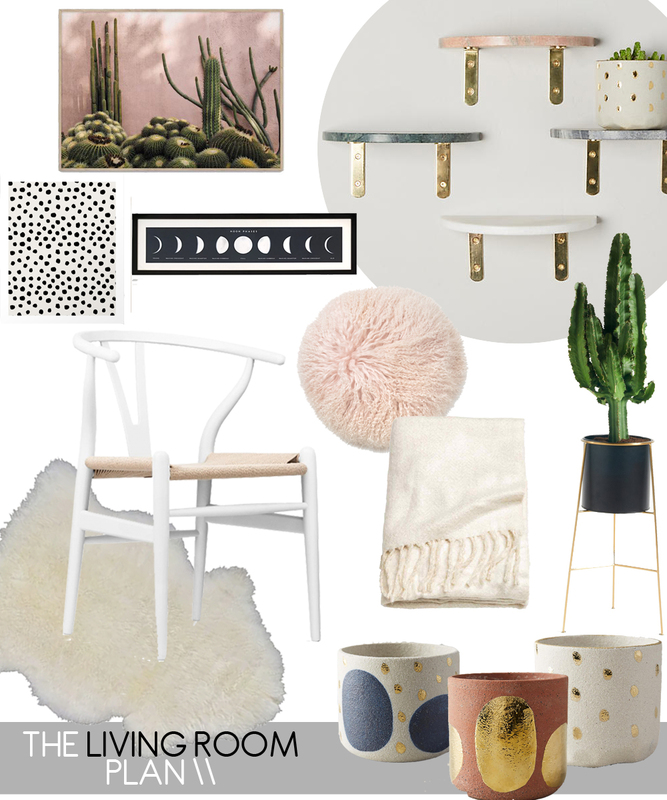 The dream would be to paint 3 walls in a pure white, with one dark grey statement wall, but for now, I think I'll just fantasise about white, pink + more spring-coloured accessories. Before going overboard with fluffy cushions + rose pink pots, there is something we actually do need and that's dining chairs; so no more dinner on the sofa + we'll both be able to work at the table at the same time. We have an Ercol drop-leaf table which is AMAZING and a piece of furniture I've always wanted but never thought I'd get, so I thought that matching chairs were the way to go, but with a lot of original + mid-century inspired furniture in one space I think it might be a bit of an overkill. Instead, I think something more modern with an interesting shape and in white would look so much better, especially against the dark grey walls, so say hello to my current obsession; the wishbone chair, a reproduction of the iconic design by Hans J Wegner. They are quite pricey, hence why I've lusted over them for a good year now and never purchased, but I guess if I settle for something else I'll always look at them and wonder 'what if?' (so dramatic!). I'll throw a sheepskin over each one for a bit of cosiness + hopefully it'll look as amazing as I imagine it will! After dining chairs, my next goal is to create some form of gallery wall; it'll break up the grey + just add some colour to our walls! I've fallen in love with the Plants on Pink print from Mink Interiors; (why do pink and green look SO good together?! ), and I think I'll use it to base the rest of our art around; adding in a bit of monochrome + patterns. Living in a rented flat, we can't really put anything into the walls, so I think we might go for the picture shelf from Ikea, that way you only have two screws going in to the wall. What do you think of my plans so far? If you live in rented, what have you done to add your own touch into your home?